Welcome to the Mid Wessex Singers! We are a friendly group of people who enjoy singing choral music in parts. We practise on Tuesday evenings during term time from 7.15 to 9.00 p.m in the West Street Church Hall in Somerton. If you would like to join us there are no auditions. Just come along one Tuesday evening or contact us. Since our formation in 1999 we have performed two concerts a year, at Christmas and in Spring. Under the guidance of our Musical Director, Graham Coatman, we are now expanding our repertoire and range of events. 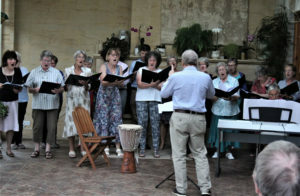 In 2017 we started an annual ‘Come and Sing Day’, and in 2018 extended our season to include a summer term, with an informal performance of light music to family and friends at our Summer Soiree. Also in 2018 we added an Autumn concert to our schedule. As a registered charity we also provide entertainment to people in local care homes and sheltered housing. Look out for news here or contact us. Keen singers, you are invited by the Mid Wessex Singers, to experience the motivational guidance of our Musical Director, Graham Coatman, in a summer season of light music. Following our performances of varied and enjoyable music at our Autumn, Christmas and Spring concerts, we are looking forward to a relaxing term starting on Tuesday 30 April, culminating in an informal performance to invited guests at our Summer Soiree on 2 July. We rehearse from 7.15 to 9 pm on Tuesday evenings at West Street Church Hall, Somerton TA11 7PR and the summer term is on a ‘pay as you go’ basis of £3.50 a week. For further information please ring 01458 274139 or e-mail info@midwessexsingers.co.uk.